A message of blessings for the Days of Awe from Rabbi Sharon Kleinbaum. During the High Holy Days season of self-reflection, we looked back on our acts of the past year, considered how we have affected the lives of others, and made commitments for the year ahead. Your pledges in support of CBST enable our remarkable community to continue to change lives and make history. Thank you. Our long-standing Open Door policy is sustained by support from CBST Members & Friends. We welcome ALL who wish to share the High Holy Days, Shabbat, and the holidays and festivals throughout the year, always without charge. Watch videos and read drashot from past High Holy Day services. 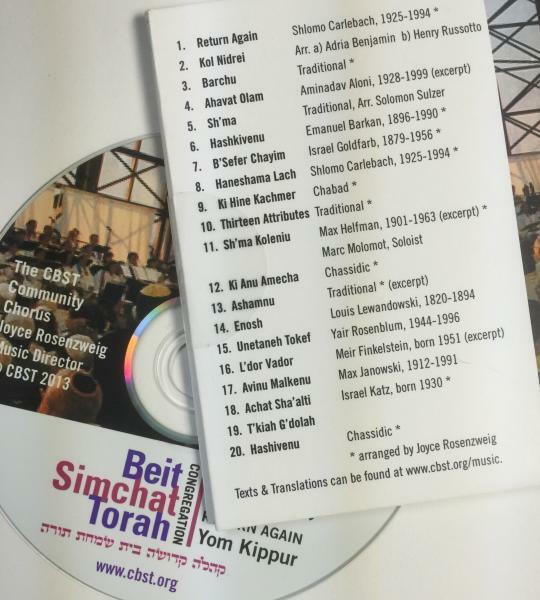 Listen to a sample from our High Holy Days CD, "Return Again, Hashivenu"